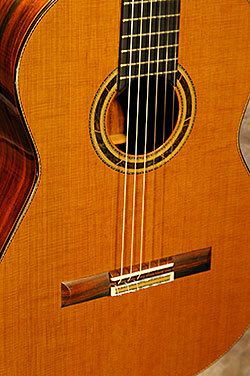 Series 45 guitars are a batch of four guitars celebrating 45 years of stringed instrument making. 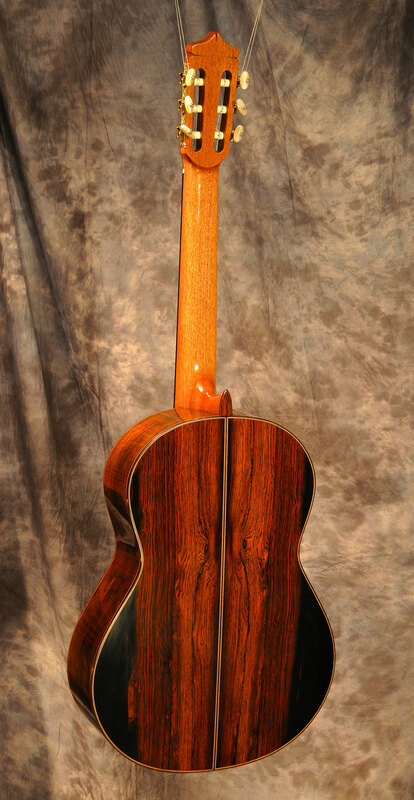 These guitars were completed in 2015. The woods on these guitars are full of unique character and sets that I have been collecting for several decades. Spruce tops with bear claw patterns or amazing amounts of cross silk, cedar tops with rippling flame patterns. 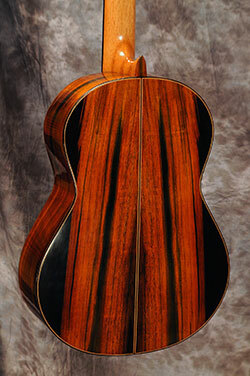 Brazilian rosewood with spider web grain or other very rare patterns and colors. 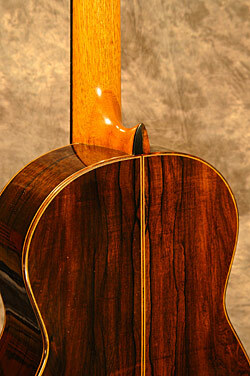 All the woods have exceptional tonal qualities. 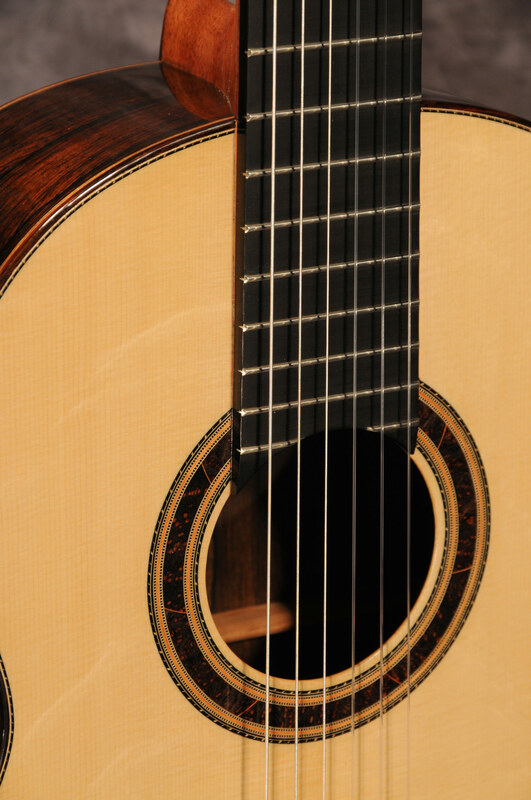 The tuners are either Rodgers or Graf engraved with the traditional Esteso design. 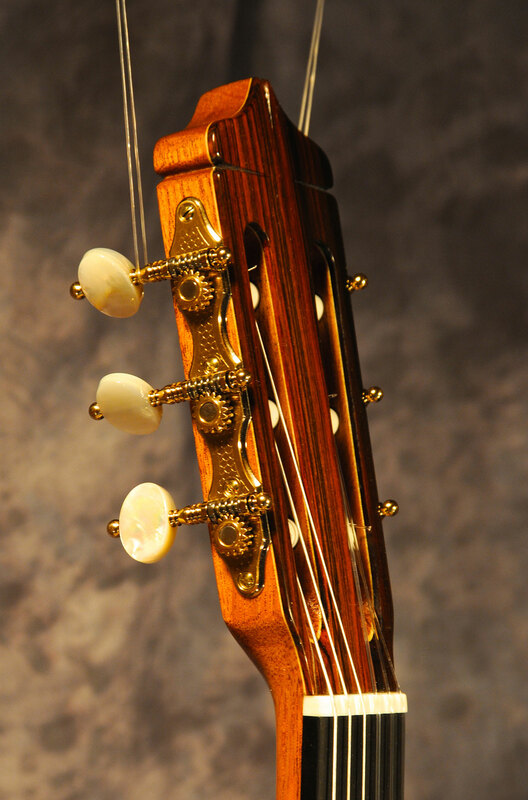 Each one of these guitars will be unique and one of a kind, to be treasured for many years to come. Series 45 number one of four. Torres size guitar with Bear claw spruce top and spider webbed Brazilian rosewood. 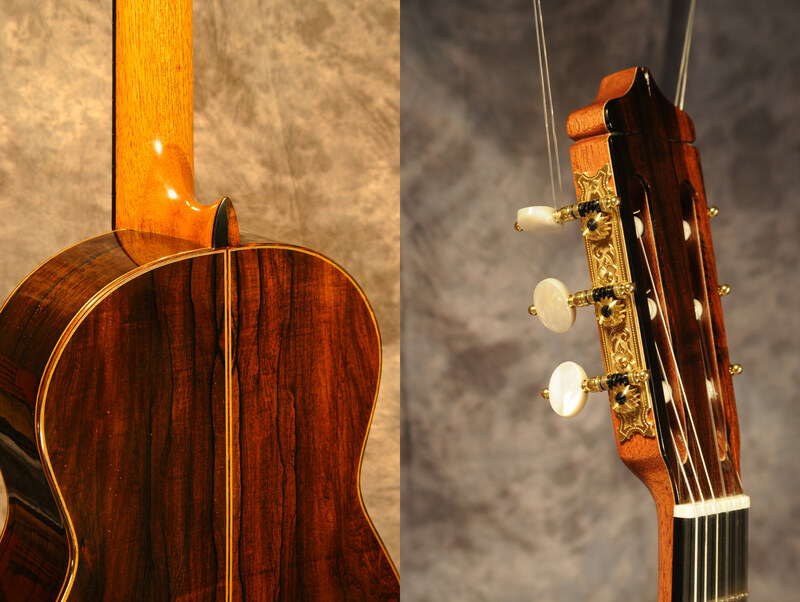 The scale is 645mm, 52.2mm wide nut, Rodgers tuners, all French polish. 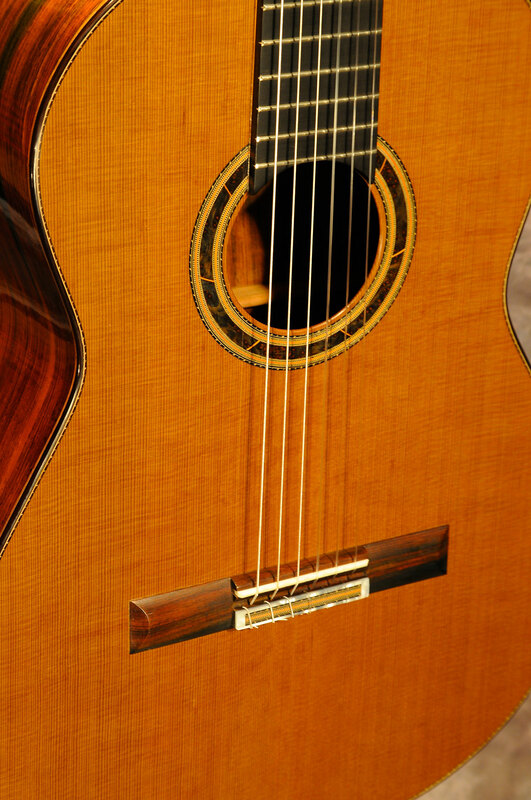 The sound is already rich and sweet with loads of projection and plenty of volume. 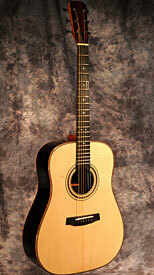 A beauty of a guitar! Series 45 number two of four. 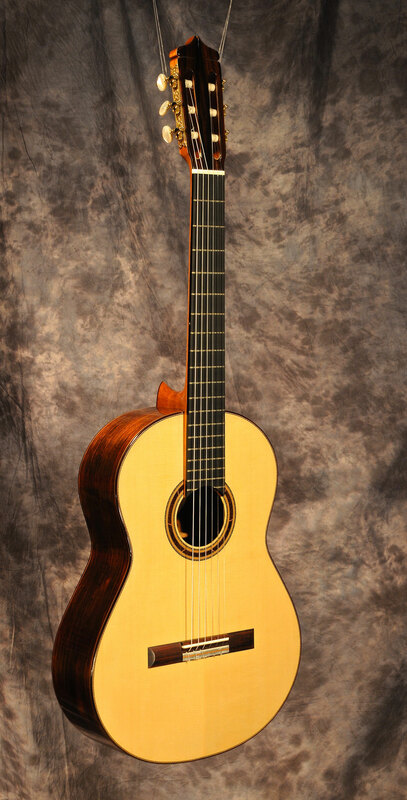 Ancient Brazilian Rosewood from the 1850s, traditional cedar top with ribbon flame, 650mm scale, 52mm wide nut, Graf tuners (Esteso model available), French polish finish. 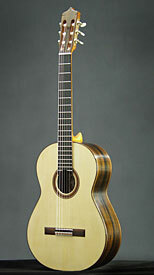 $10,000.00 with case and polishing cloth. Series 45 number three of four. Ancient Brazilian rosewood from the 1850s, Spruce double top, 650mm scale, 52.5mm wide nut. 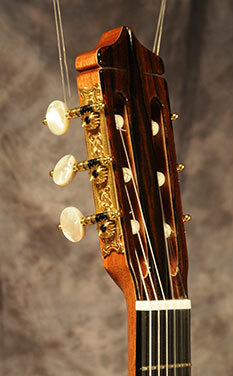 Rodgers tuners Esteso style, French polish finish.